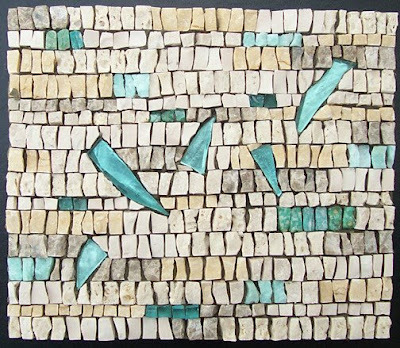 Margo Anton's Mosaic a Day: "Shards"
I'm still enjoying creating these rhythmic pieces, but decided to mix it up a little by varying the marble color in a non random, deliberate way. I always want these pieces to impart a sense of tranquility, and this one does that, I think. On another topic, I will be taking a break from mosaic a day beginning later this week to work on a large backsplash project that I've been putting off. I would be happy to blog my progress on that if people are interested. Let me know! And yes...please do blog the W.I.P. of the backsplash. Fun to follow along and watch the progress. Love your mosaic a day, by the way. Its fun to see them in my in-box everyday! Margo -- yes, absolutely blog the backsplash. I'd love to see how it takes shape.